If you work in a graphics editor, whether it's Adobe Photoshop or Corel Photo-Paint, you probably know the so-called convenience of calling the palette convertion windows, image cropping functions, and so on. The studying of hot keys leads to overheating of neural networks of the brain. If you do not need something out of the ordinary, such as filters for photos or masks, but you just need to crop some part of the image, connect pixel A to pixel B with a line or change bitmap depth, then this program is just what you need. 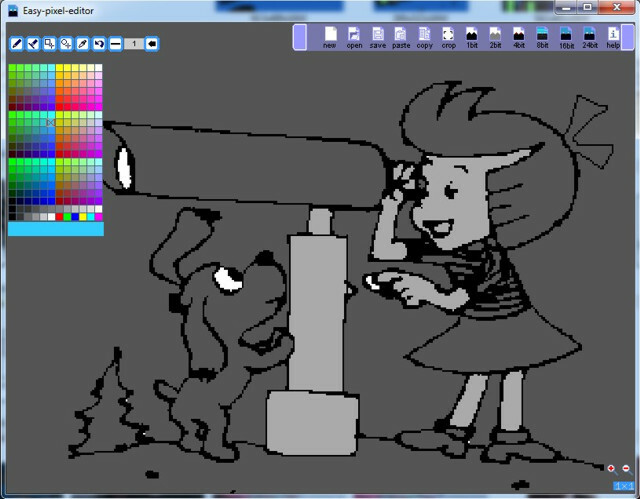 Graphical editor Easy Bitmap Editor was designed for such purposes - quickly fill parts of image, quickly draw a line or a point, convert to the desired depth of the palette, crop the necessary part of the picture in 2 clicks. How to work with Easy Pixel Editor? Watch video. For example, there is a task to open 20 images, double their size, cut a certain area and save it to a file. In traditional graphic editors, before we start cropping image, we need to increase it's size (not visually, but fix it, passing through many dialog boxes with confirmation of our action). In Easy Bitmap Editor you can simply increase the size of the image visually and it will be automatically fixed at required size, then this part of image could be cutted and immediately saved. One save dialog. This editor was created for a specific purpose - to reduce the time for routine work. 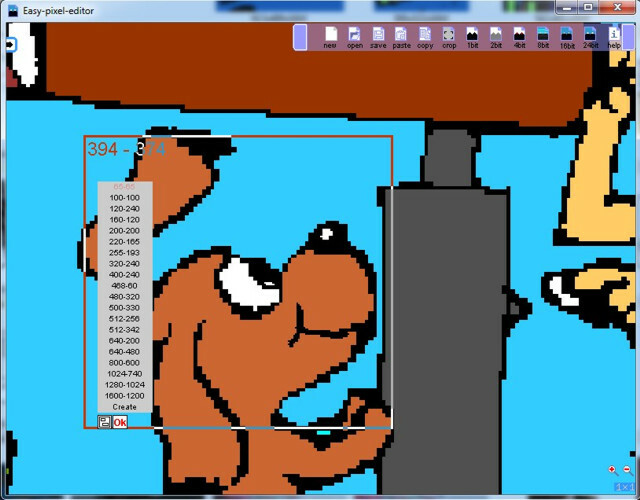 Try Easy Pixel Editor to draw, change depth, resize and crop images. When can this program could be useful? In cases when you need to quickly convert pictures to 1-bit, 2-bit, 8-bit, 16 and 24-bit, fill the monochrome parts of image by doubleclick on it, fix any small artifacts, quickly enlarge and crop the picture. All this without additional dialog boxes. Change image's depth in 2 clicks! In the editor you can also draw with pixels and line, use simple primitives such as circle/square. You can fill closed shapes with doubleclick on it, use colorpicker to determine previously used color on picture and, as said before, crop the selected area of ​​the image. 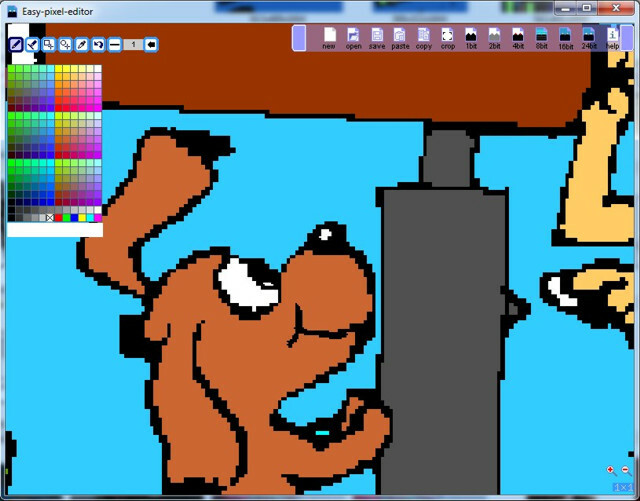 For the Paint Bucket Tool there is no button here - it's just active by default and is triggered by double-clicking on the left mouse button with the drawing tools turned off. The editor copies the image to the clipboard and can paste an image from the clipboard. When creating a new picture, you can select the popular resolutions, the same with the cropping function. You can save images as PNG, JPEG, BMP files, and open almost any popular graphically format. The program is provided as is. For sure, there are many bugs. But we're not Adobe. 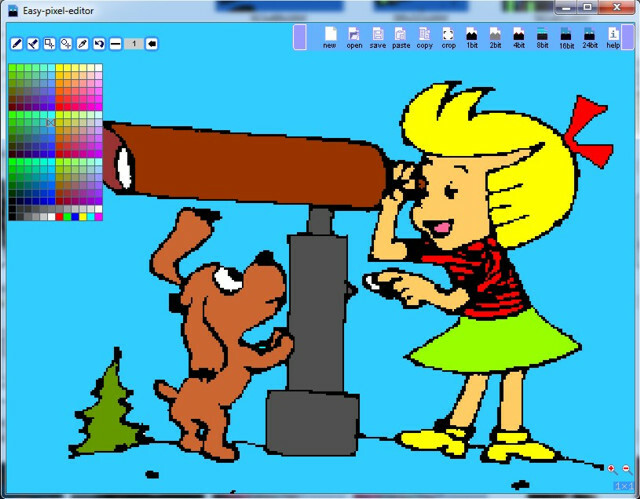 If you want to try it just download Easy Bitmap Editor from our site. Zoom picture, crop it and save zoomed region as file. Easy!